“The Night Before Christmas” is truly an American classic, and it has unquestionably infiltrated pop culture. The images depicted in the poem and the illustrations that accompany it have formed much of the idea of an American Christmas celebration and our vision of Santa Claus. At the time of the poem's publication, New Year's Day was the main family holiday of the season. Christmas was far less popular due to considerable Protestant distaste over a perceived foolish holiday. However, Moore's vision of St. Nicholas sneaking down the chimney to deliver presents to children caused a near-immediate acceptance of the holiday as a family and child's celebration. Santa climbing down the chimney was depicted in this 1947 edition illustrated by Hilda Miloche and Wilma Kane (at right). In an edition dating back to (circa) 1850, the image of Santa Claus making his way down the chimney on Christmas Eve was likewise front and center. Fisher and Brother of Baltimore published this early edition, and it's clear when comparing it to the 1947 Miloche and Kane illustrated edition above that the idea of Moore's Santa Claus had definite staying power. Arthur Rankin's lithograph from a 1931 publication is a lovely example of the poem's shifting focus on children. The image depicts three siblings under a quilt, peacefully awaiting Santa Claus while under the protection of a trio of golden angels. 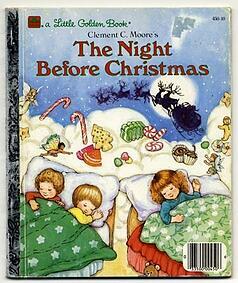 A 1987 printing from Little Golden Books (at right), a childhood staple, again depicts three siblings asleep in their beds, this time taking a more whimsical route with the illustrations. The sugarplums and fairies dancing above their heads are colorful and perfectly reflect the joy and imagination of a child's Christmas. 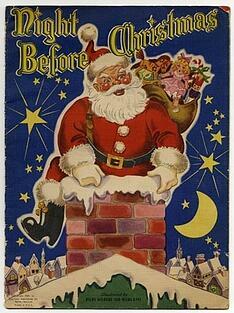 Moore's poem was also the first instance of Santa Claus being depicted as jolly. 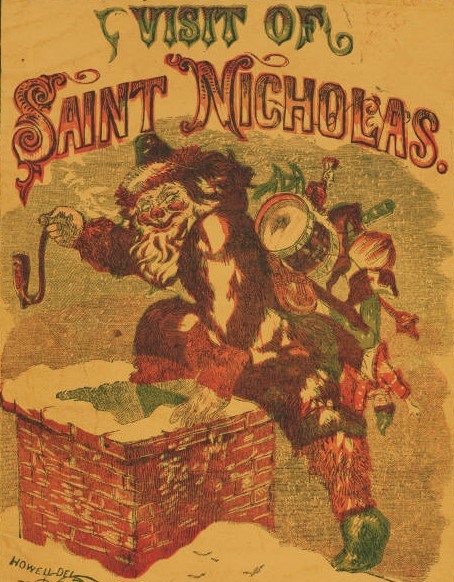 The “jolly old elf” persona was inspired by both traditional images of St. Nicholas and a local Dutch handyman in Moore's town. This happy, red-cheeked Santa was even further popularized by his starring role in generations of Coca Cola Christmas ads and commercials. What Americans now think of almost exclusively as the preferred image of Santa Claus can be seen on the cover of a 1953 Whitman Publishing Company version (at left), illustrated by Zillah Lesko. Saint Nick can be seen seated in a rocking chair surrounded by toys he himself delivered and reading a book, perhaps even the very book that shaped the image of a classic American Christmas. 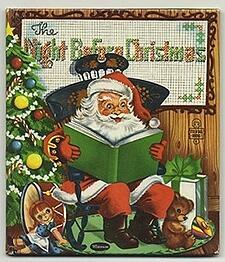 On this Christmas Eve, we'd encourage you to enjoy the tale of "The Night Before Christmas". Gather family around for a reading after dinner, or snuggle up with your kids before bed to share the familiar story. Enjoy the timeless words, and savor the charming illustrations (in any number of editions!). After all, the book paints a perfect picture for anyone who holds on to the hope of sneaking their own peak at Santa Claus. Merry Christmas Eve, everyone! For more information on collecting the numerous editions of "The Night Before Christmas", we recommend consulting a comprehensive bibliography such as Nancy H. Marshall's 2002 publication, found here.